Loadstart.biz is a dubious website and a browser hijacker. If you find it on your computer, you must have recently installed free software. Users usually do not install hijackers themselves. They are attached to free software in a hidden manner and if you do not deselect them during installation, you will end up allowing them to install. While not malicious, hijackers are not pleasant to deal with. They change browser’s settings, set different homepages and force you to use questionable search engines. In the case of this threat, while it may not be as dubious as some other hijackers, it still does not belong on your computer. It may try to redirect you to sponsored sites since that is how they make money so to avoid this annoyance, remove Loadstart.biz. How does a hijacker enter a computer? Browser hijackers are attached to free software as extra offers and if you want to prevent their installation, you need to manually deselect them. This can be done in Advanced or Custom settings of the freeware installation process. Just uncheck the boxes of all added items and just continue the freeware installation. Do not use Default settings because that is exactly the reason why you are now stuck having to delete Loadstart.biz. Always pay attention to what you are installing and how you do it. Dealing with a hijacker may be tricky. It will change your browser’s settings and set its domain as your homepage and new tabs without permission and you will be stuck with those changes until you remove Loadstart.biz. It should also be noted that the changes will affect all leading browsers installed on your computer, including Internet Explorer, Google Chrome and Mozilla Firefox. 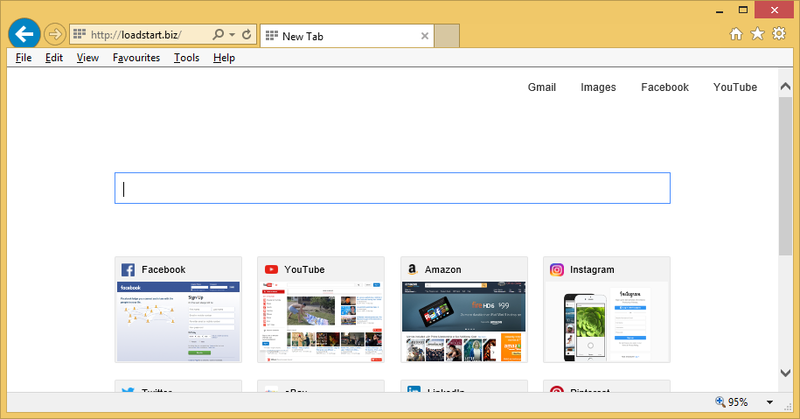 Your new homepage looks like a new tabs page. It has quick links to websites such as Facebook, YouTube, Amazon and eBay. It also has a search box that will lead to Google. Your default search engine will also be set to Google so if that was not the search engine you used until now, you will be forced to use it now. You don’t have to put up with it, however. We never recommend keeping hijackers on your computer because they do not belong there. Some hijackers are able to lead users to malicious content and that should be reason enough to delete Loadstart.biz. There are two ways to uninstall Loadstart.biz, manually and automatically. If you go with manual Loadstart.biz removal, you will need to find the hijacker yourself, which could take time. This is why we would advise the automatic method. Obtain professional anti-spyware software and use it to get rid of the hijacker.